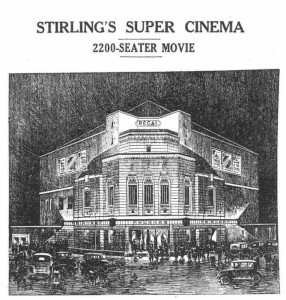 Motion pictures came to Stirling relatively early after the invention of the motion picture camera in the 1890s and the town had several cinemas indicating the popularity of going to the pictures in the era before radio and television. 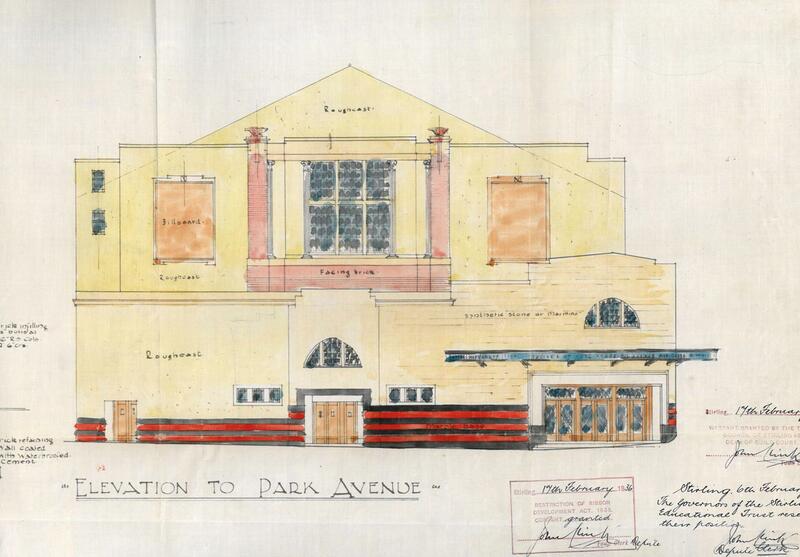 Some lovely plans survive in the Stirling Dean of Guild collection and they, along with articles in the Stirling Observer, give a history of film in the town. The first cinema to open in Stirling was the Olympia Picture Palace in Orchard Place in 1911. This building was erected in 1909 and opened on the 4th November of that year as a roller skating rink. It was situated opposite the foot of King Street. The architect was Ronald Walker. It was clad with corrugated iron on a frame of iron girders and roofed with felt. It opened as a cinema in April 1911 and could seat over 2000 people. It was gutted by fire on Thursday 3rd February 1921. No plans survive for the cinema conversion. 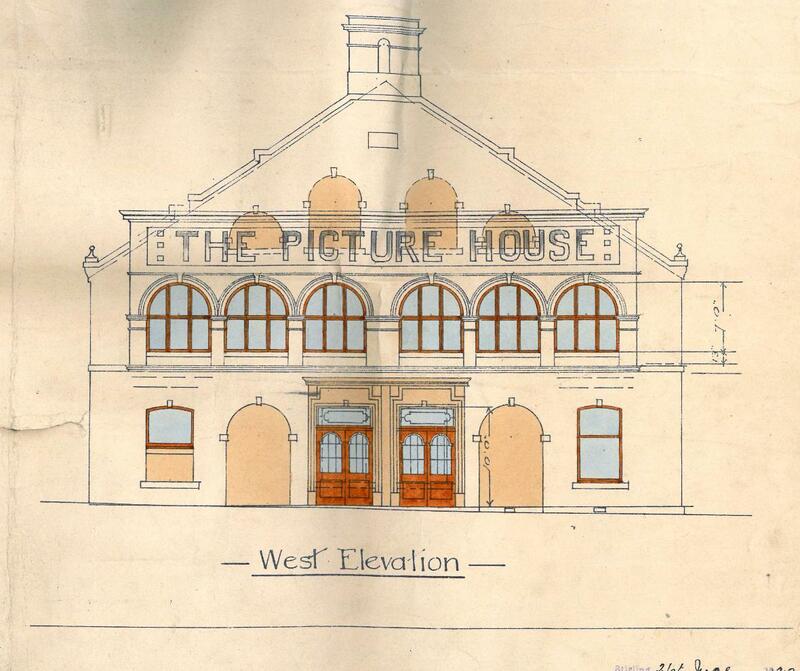 The next picture house to open was the ‘Electric Theatre’ in Upper Craigs. The building was originally a garage but was converted to a cinema in 1912. The plans are held as part of the Council’s Dean of Guild series and are dated 21st October 1912. 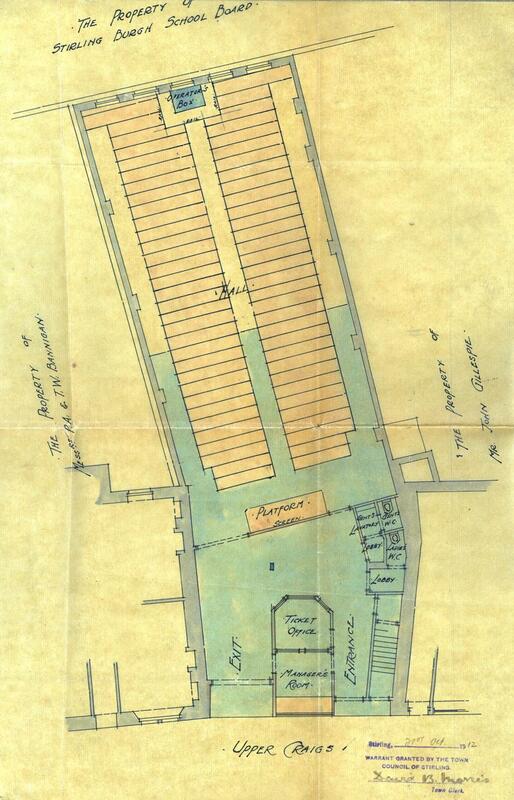 The description given with the application says that the building is ‘to be altered for a cinematograph hall’. The cinema was opened in early November 1912. 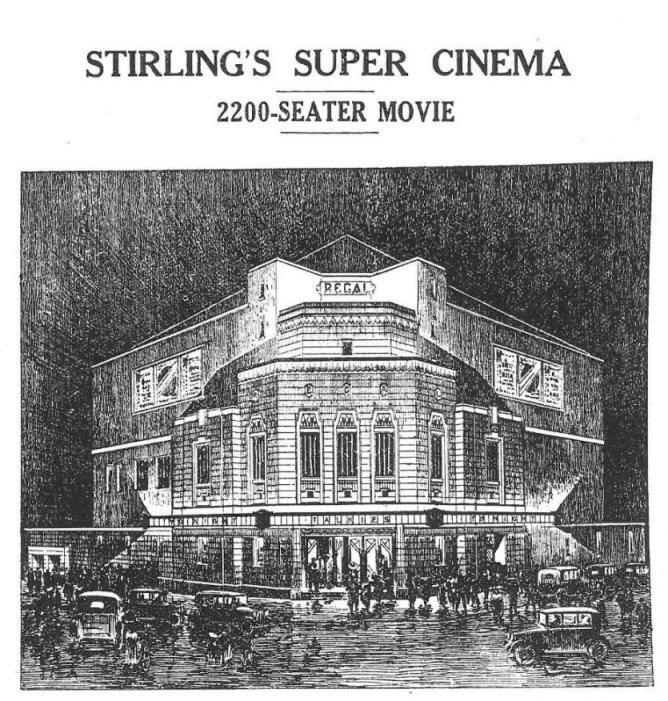 As moving pictures became more popular, more cinemas opened in Stirling, the next being the ‘Kinema’ Picture House in The Craigs. This building opened on Tuesday 21st December 1915 and the architect was Ebenezer Erskine of King Street, Stirling although no plans of the building have survived. After 30 years as a picture house, it was converted into the Plaza Ballroom after the end of the Second World War and eventually became a bingo hall and casino before being demolished. 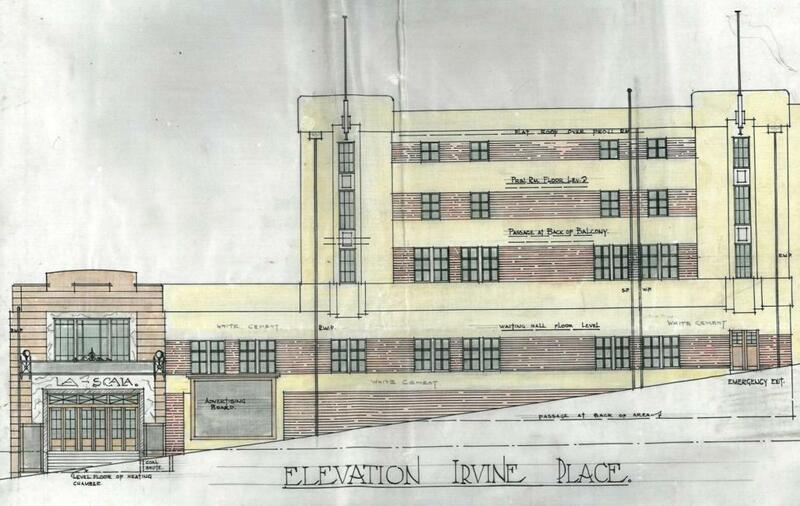 Attractive plans survive for the Thistle Street Picture House, Thistle Street, dating from 1921. 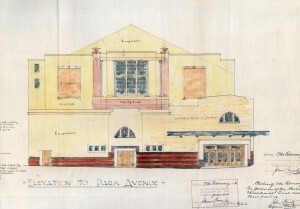 The building opened on Saturday 19th February of that year but the plans are dated 1st June 1920. The picture house was constructed from part of ex-Provost Thomson’s coach showroom in Orchard Place and part of the old Union Halls in Thistle Street. The building was eventually demolished during the clearance of the site for the new Thistle Centre. 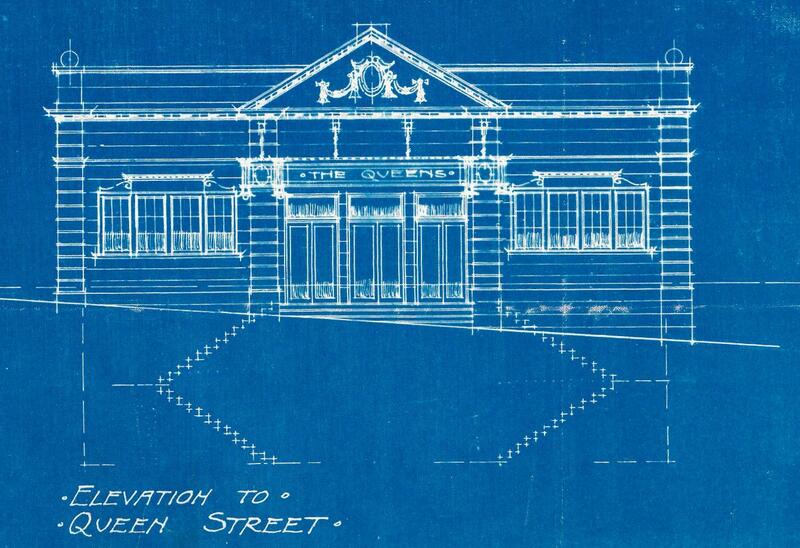 Blueprint plans are held for the Queens Cinema, Queen Street, dated 1st June 1927. The cinema was opened on Wednesday 12th September 1928. The building was gutted by fire on Friday 22nd November 1957 and never opened as a cinema again. The building was finally demolished in 1991. 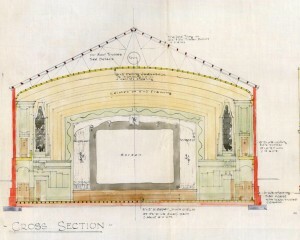 You will have heard of La Scala Milan but not of ‘La Scala’, Irvine Place, Stirling because the cinema was never built. 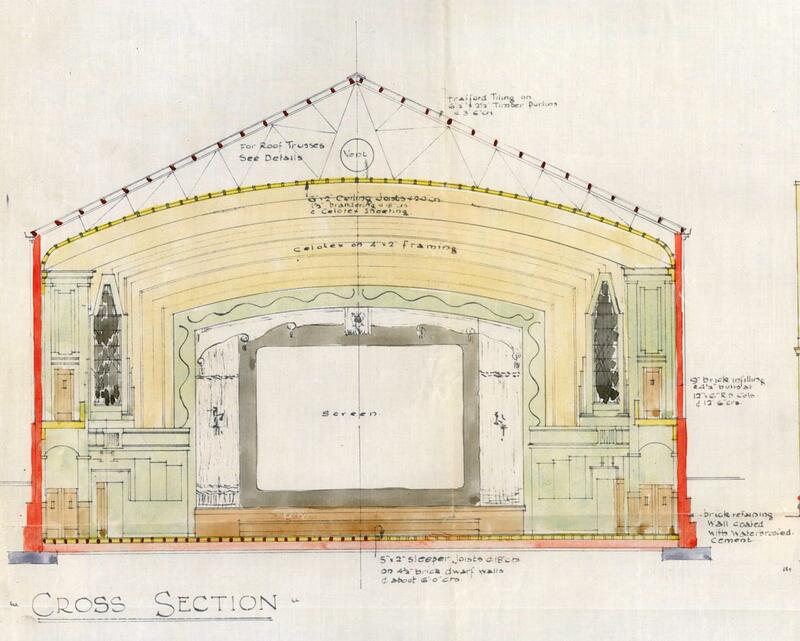 Plans were submitted to the Stirling Burgh Council Dean of Guild Court on 1st September 1932 for a cinema on the corner of Irvine Place and Princes Street, Stirling. The architect was Hamilton Neil. 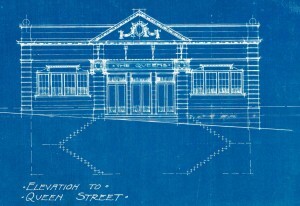 In the plan register held at the Archives, the entry for this application to build is marked ‘plans withdrawn’. However, of a very similar design is the Regal Cinema, built in Maxwell Place, also in 1932, and it may be that the developers moved the previous ‘La Scala’ project to this site. 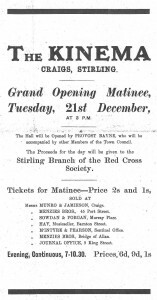 The Regal was opened on Monday 3rd October 1932 by Stirling’s Provost Duff. The Architect was C.J. McNair. 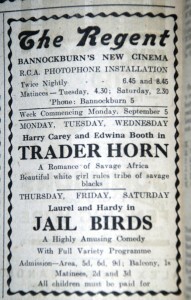 The manager of this cinema in 1938 was a Mr James Nairn who is known for making films of the Stirling area. The cinema closed on 16th March 1968 and was demolished to make way for the new inner relief road that opened in 1970. The Regent Cinema, situated at Quakerfield, Bannockburn was also built in 1932, when the popularity of cinema was at its height in Britain. It opened on Monday 5th September in that year. The Regent closed on Saturday 10th December 1960, and was later used as a store and bingo hall before being demolished. 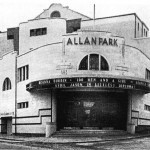 The Allan Park Cinema was built at Allan Park, Stirling in 1938 and opened on Wednesday 5th October. It was built for Cinema and Variety Theatres Ltd by Conoboy and Christie, Contractors, Stirling and designed by Sam Runcie, Architect, of Glasgow. 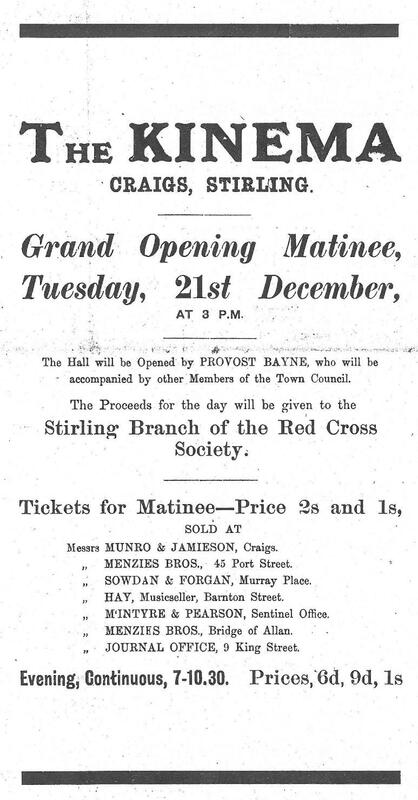 The cinema was opened by Provost McAllister and seated 1,700 people. Although no longer a cinema, this iconic art deco building is still in use as a church and bingo hall. Films were also shown on a regular basis in Stirling at the Alhambra Theatre, The Arcade, which was built in 1882, and at the Randolph Cinema owned by Stirling Miners’ Welfare at their building at Bughmuir between 1930 and 1934. Family lore has it that my grt. grt. 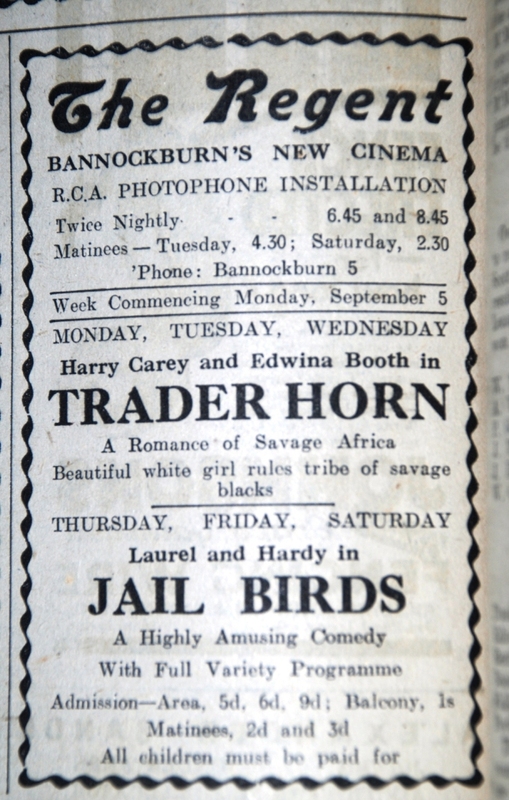 Uncle David MacGregor opened first cinema in Bannockburn. I havent been able to confirm this. Do you have records of owners/managers of the cinemas? The MacGregor family lived in the Feus for over fifty years. We will look forward to meeting you soon. Is Allan park cinema building a listed building? 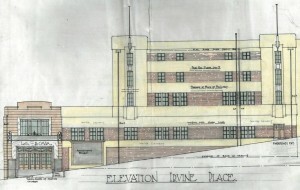 Would hate to see this iconic Art Deco building disappear. Hoping that this building is preserved? Such a huge part of my childhood and teenage years. Hi Pauline, thank you for your comment on our blog post. 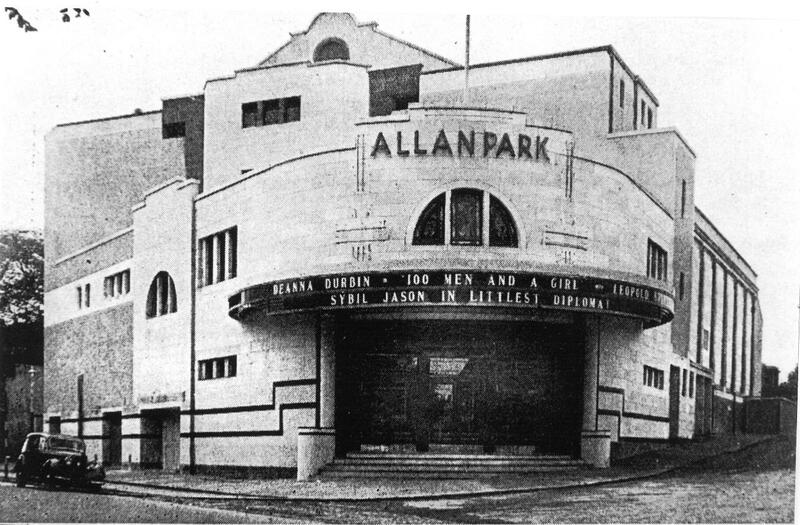 I think many people from Stirling have happy memories of film shows at the Allan Park Cinema and it is a great example of a 1930s art deco building. I have checked on the Historic Environment Scotland website, and it looks as if this building is not listed, which seems a shame. It is still in use though, so there doesn’t seem to be any immediate threat to it. I hope that you continue to enjoy our blog.